I have to say I think Shimmermint is a gorgeous shadow, but I can mix up something similar with some pigments and micas, so I didn't get that. The only thing I did pick up was the Mineralize Eye Shadow in Snow Season, which is the most "neutral" shade out of the eye shadows I saw. 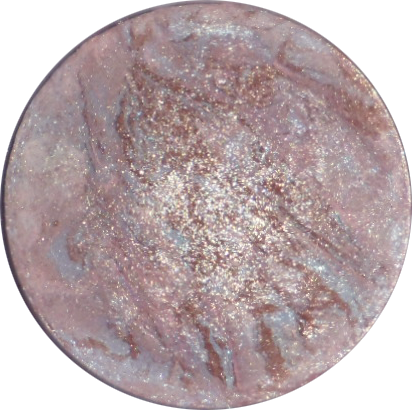 In the pan, MAC Snow Season looks like an opalescent pink-silver, swirled through with bronze and tiny pale gold flecks. Rubbed on, it softens out to a very soft glimmery beige with ivory-mauve tones (below). As always, the camera does not do these Mineralize products justice, so do keep in mind that they tend not to do too well in photography. Texture-wise, Snow Season is (and most of the other Mineralize shadows are) very similar to Luster shadows in that they are filled with lots of fine-grained mineral flakes that give it that translucent, glittery effect. In terms of opacity and true payoff they are seldom as strong as the regular shadows, unless used wet. The bad thing is that if you want intensity, you need to use a good base or mixing medium. The good thing is, you can get a soft glimmering wash without worrying about over-applying. For this weekend eye, I wanted to keep things very clean and bright, but still get a defined eye without having to do a lot of contouring and layering of colors. Step 1: Use the copper liner to draw a simple line along the upper lash line, keeping it thick enough to be visible. At the outer corners, thicken up just a bit and then pull upwards in a flick, like a normal kitten eye. Step 2: With the pencil, draw a line from the center of the SOCKET line outwards, to connect with the end of the flick. (Find it by feeling for the deepest part of your socket, between your eyes and your brows.) With a finger, gently smudge away the innermost portion of that socket liner so it looks like it "fades" into your crease, instead of ending abruptly. Line your waterline as well. Step 3: Apply a simple wash of pale shimmer to the lids, blending into the socket liner (but not covering the outer ends of the bronze liner. If you want to keep the look strong, reapply bronze pencil. The finished look at this point should be a defined crease liner in a beautiful shade of coppery-bronze, with a soft wash of beige on the lids. Step 4: Finish with black mascara (curl your lashes first), and black liquid liner on the tide line (under your upper lashes) for definition. Not so much a fan of the MAC powder. BUT I LOVE LOVE LOVE the eye look!